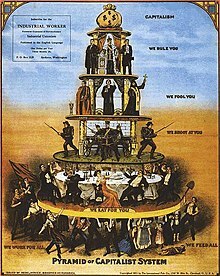 Class conflict is both the friction that accompanies social relationships between members or groups of different social classes and the underlying tensions or antagonisms which exist in society due to conflicting interests that arise from different social positions. There’s class warfare, all right. But it’s my class, the rich class, that’s making war, and we’re winning. When questions of “class” interests are eliminated from public controversy a victory is thereby gained for the possessing, conservative class, whose only hope of security lies in such elimination. Class struggle is inextricably bound to the struggle to end racism. bell hooks, Feminist Theory: From Margin to Center (1984), Chapter 1: Black Women: Shaping Feminist Theory, p. 3. The working class and the employing class have nothing in common. There can be no peace so long as hunger and want are found among millions of the working people and the few, who make up the employing class, have all the good things of life. Between these two classes a struggle must go on until the workers of the world organize as a class, take possession of the means of production, abolish the wage system, and live in harmony with the Earth. Prestige bars any serious attack on power. Do people attack a thing they consider with awe? Empire has manufactured a discontinuity in popular struggle, while maintaining continuity in its own growth and consolidation. One of the empire’s principal tools and weapons has been its prisons. This page was last edited on 1 April 2019, at 14:37.